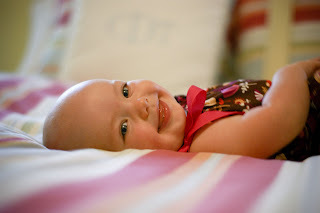 Last week we had Avery's 12 month doctor's appointment, so I thought I'd give a little update on her status. She currently weighs in at 24 pounds and 30.25 inches. This brings her to 90% in weight and 75% in height. Needless to say, she's a big girl! On a much lighter note, check out these comparison shots Brooke captured. This at 3 months. This one is at 12 months. We will keep you in our prayers - it is always hard when it comes to our little ones. My daughter had what seems as the opposite of yours, her toes pointed in (often called pigeon toed) we of course never really noticed this until she started walking - she would trip over her feet and had trouble running, Lucky for us all she needed was to wear special shoes that forced the feet outwards, she wore them for a good year and a half, in bed, all day long - but her feet grew straight afterwards. I am surprised that your doctor will want to do something so soon, as babies legs are still growing and will tend to straighten out as they grow, I have also heard that if you had to choose if you child had issues with walking in or out - out is easier to deal with. Sorry to get so long and winded - I just thought you could use some encouraging words and a story from a mom who's kinda been there. Best of luck.